Motorola hasn’t launched a smartphone with triple or four rear camera setup as we have seen on the recently launched Samsung Galaxy S10 5G and the Galaxy A9. However, we got our very first look at what could be an upcoming Motorola device called the Moto G8 or maybe the Moto P40 Power with triple rear camera setup a few days back, all thanks to OnLeaks for sharing the first renders of the device. 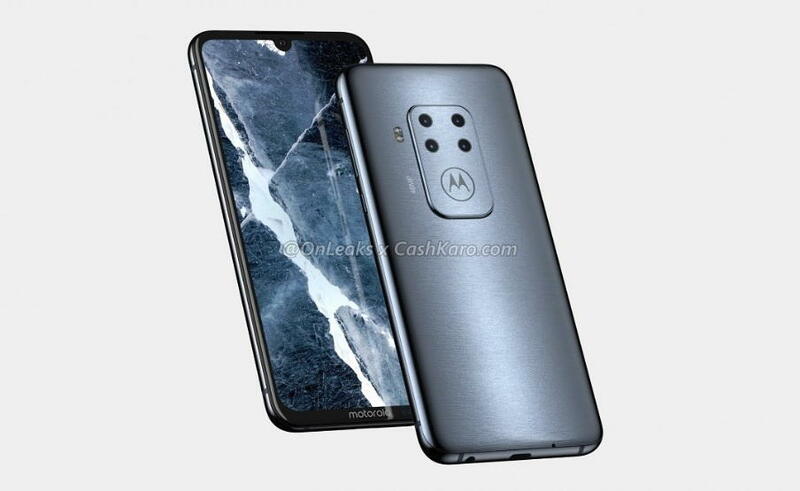 Now, he has shared the first 5K renders, 360° degree video and the some of specs of another Motorola device via folks at CashKaro that appears to have four rear camera setup. However, the device name is not yet known. The renders and the 360° degree video does give us the very first look at the upcoming Motorola device from all angles. The first thing that catches our attention is the first ever seen four rear camera setup at the back of an unknown Moto device. The four camera setup can be seen placed in a square arrangement along with the Motorola logo underneath. The render also reveals that one of the cameras on the device will include a 48-megapixel sensor. The pecs details reveal that the alleged moto device features a 6.2-inch AMOLED display with a waterdrop notch and an in-display fingerprint scanner. At the bottom, we have the USB Type-C port, mic, and the 3.5mm headphone jack. The display has a very low chin that features the Motorola logo. The device appears to be a flagship device and if it is, we can expect the device to come with at least Snapdragon 855 SoC coupled with 6GB or 8GB RAM and up to 256GB storage. There are no further details available about this new mysterious Motorola device as of now.